If there is a person in need, the Cooper-Young community will come together to help out their neighbor. At 9 ‘o’ clock on a Saturday morning residents from the area showed up at the house of Robert Johnson Sr. to show how much they care for each other. The goal of the day: Build a ramp for Mr. Johnson. Johnson has been resident of Cooper-Young since 1972. About a year-and-a-half ago he was in a car accident in the Midtown area and around this time, also suffered a stroke. “After that I just wasn’t able to do things that needed to be done around the house,” said Johnson. A few months later, his wife of 66 years, Selderia Johnson, started to have to have knee problems “my knees started failing me about 5 years ago and things just got worse and now I can’t walk without a walker,” said Mrs. Johnson. Because of limited space in the home and without a safe way for Mrs. Johnson to get in and out of the house her wheelchair is kept in the garage. Shortly after his wife began having knee problems Johnson went to the Cooper-Young Community Association to ask Community Director, Kristan Huntley for assistance. Recently Christ City Church reached out to Huntley about helping the Cooper-Young Community. 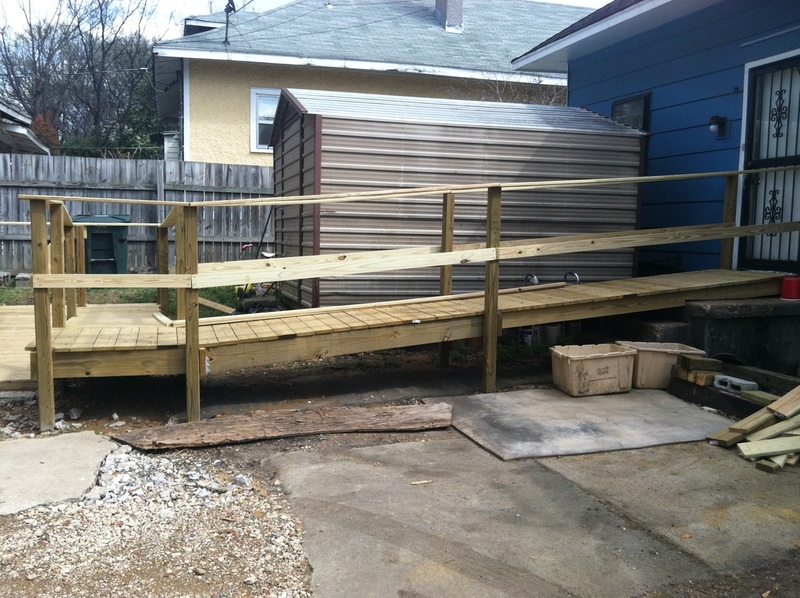 “We discussed several things but Mr. Johnson’s ramp popped in my head,” said Huntley. Christ City Church has an outreach program known as a “neighborhood parish”. They have carpenters, construction workers, and other people that help out communities such as Orange Mound and Cooper-Young. With the help of other organizations like SOS Memphis, Christ City Church provided the materials for the ramp and CYCA provided most of the volunteers. Kristan Huntley said this project is more than just a good deed. “We’re rallying around our neighbor and partnering with this local church,” she said. “And the main thing we want to do is build community, neighborhood relations, friendships and a bond to the neighborhood. Danielle Wilburn covers Community for MicroMemphis. You can send her story ideas here. Follow her on Twitter ( @Daniellej_08 ). Leslie Jennings covers Community for MicroMemphis. Follow her on Twitter ( @Journalist_DeDe ).